Pet foxes eat things that are similar to what you would feed your pet dogs and cats. Foxes are omnivores (like dogs) therefore a balanced diet for a pet fox includes vitamins, minerals, meat, vegetables, and other foods. In the wild, foxes generally hunt small rodents. From a very early age, they learn their characteristic pounce in order to quickly and quietly catch their favorite food. But your pets don't have to hunt in captivity. Instead, you generally should offer a formulated fox food (that contains taurine) since it has most of what your pet fox needs along with pre-killed mice, small rats, fuzzies, or pinkies depending on the size of the fox. Fennec foxes will typically stick with the mice and smaller rodents while red or Siberian foxes can enjoy a rat or even a small rabbit since they are a little bit larger when compared to a fennec. Regardless of the source of the protein, the majority of your fox's diet should be protein. Insects are also a large part of a fox's diet. In the wild, a lot of a fox's day is spent foraging for grasshoppers, crickets, caterpillars, silkworms, beetles, and mealworms in addition to an occasional crustacean (such as a crayfish). Thankfully, in captivity, it is easy to feed a few dozen mealworms, gut-loaded crickets, or larger insects since these are readily available from pet stores. Some fox owners also opt to feed their pets raw meat. There are mixed feelings about feeding raw foods to pet foxes, but if you choose to offer raw meat to your fox, make sure you are feeding whole prey items, meaning entire chicks, mice, rabbits, and squirrels. 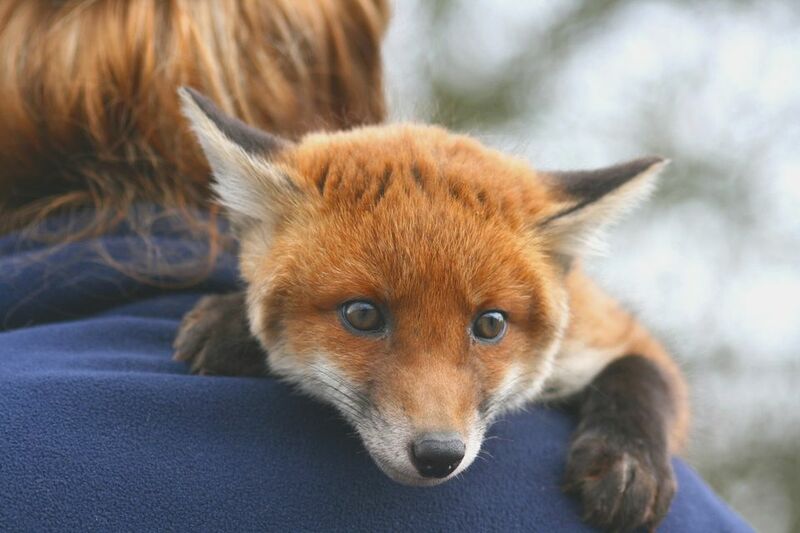 Foxes need the organs, skin, and other benefits of the entire animal, not just the muscles as would be provided with a chicken breast or steak. Vegetables, such as mixed frozen vegetables, cherry tomatoes, and other bite-sized veggies, should be offered to your fox daily. For smaller foxes, a few teaspoons of vegetables a day will suffice but offer a few tablespoons for larger foxes. If you notice your fox's stool has a lot of vegetable matter in it, you are probably feeding too many veggies and should cut back on the amount you are offering. Fruits should only be offered as treats (unlike vegetables, which should be part of the daily meal for your fox). Foxes especially like berries and many fox owners also recommend giving cherries as treats to help with the odor of their urine. Care should be taken to avoid feeding grapes and raisins due to reports of the kidney damage they can cause. Foxes do not eat grains in the wild, therefore, you should avoid feeding things like wheat, rice, oats, and other grain matter in their food. Since foxes instead eat small prey such as mice and birds that eat grains, this is how they get some of the carbohydrates they need. The rest of the carbohydrates they require are found in the fruits and vegetables they consume. Taurine is essential to pet foxes and is typically found in formulated fox diets or grain-free dog foods (as well as the animal tissues you feed). If it isn't already listed as an ingredient in the food you are feeding your fox, you can supplement it with taurine capsules. Smaller foxes typically need about 500 milligrams a day while larger foxes will need more. Most of the vitamins and minerals that your fox needs will already be in the grain-free food you feed your fox and the rest of what they need will be in the rodents, insects, and vegetables you offer on a daily basis. Foxes need as close to a natural diet as possible. Despite the fact that they have quite the taste for sweets and other human foods, care should be taken to avoid feeding any foods other than what was previously recommended. Just because a fox likes something that doesn't mean they should eat it. If you are ever unsure what to feed your fox check with your exotics vet for their recommendations.